A bot is simply a software which can talk to you and help you get things done. The reason they are suddenly so important is that now they have come on mainstream messengers like Kik, Telegram, Slack and most importantly in April 2016, on Facebook Messenger. 2 Can I build a bot for any business? 3 How Difficult is it to Build O? People are now downloading fewer apps and spending more time on messaging apps. For the first time there are more people active on Big 4 messaging apps than Big 4 social networks. This is where it is the easiest to reach your potential customers on a messenger app, as they love to hang out here. Can I build a bot for any business? In the past 2 months, since Facebook has released bots for their messenger, there are more than 10,000 developers already working on them. There is a bot for almost anything – Here are some that you can check out. So “Yes” a bot makes sense for any kind of service, content or product based business. How Difficult is it to Build O? The simple way a bot works is if you can figure out all the questions and their right answers about a particular subject and then match them with each other. For example when I wanted to learn how to build a bot, I chose to build one “which could suggest free startup resources to you” (As this is the one subject I know in and out – experience of 18 months of startup life). Once you have figured out the theme, you need to structure the information into relevant categories and subcategories so that the bot can answer top level questions and also deeper ones on a subject. E.g. for me it was resources for Marketing, Analytics and Design as top level. Further, all these subcategories have 5 to 8 recommendations each, from where the user can directly directly go the tool’s website. For you it can be your leading to your product page, filling up an email form, getting a table booked, or online ordering for your restaurant. There are many tools to build your bot, it depends on how complex you want to go. I will be outlining the tools by which even non coders can build and deploy fully functional bots. I built Kuki on Chatfuel without any coding. You start building “blocks” which are basically your answers or recommendations for the queries your users might have. Defining phrases (queries) is easy if you know what your users will ask. I had to make questions individually for categories and subcategories. E.g. 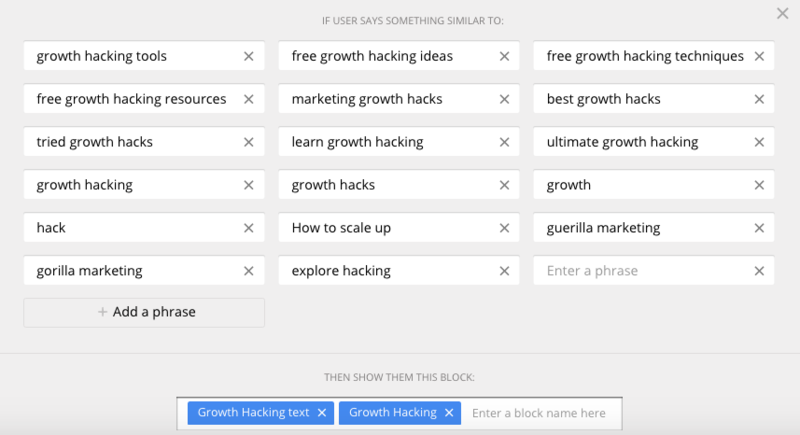 But when a user asks “I need growth hacking tips” Kuki shows the growth hacking block which recommends 6 tools. To do all this it would take approximately 7 days if you have all the information i.e questions and answers (including images and links) sorted. For the first 2 weeks test your bot with your internal group to see what phrases you might have missed out or if the structuring of answers is right. E.g. I had kept Images and Graphics as one category when people were searching for them individually. Also people wanted to learn “how to launch an app” and Kukie kept showing them landing pages. Even after pairing all the questions there will be some which you will miss out. There, your first bot is ready in 6 easy steps and 7 days. Now all you need to do is get users to talk to it and train it so that it gets better at recognizing phrases and giving relevant answers. About the Author: Aditya Ahluwalia is CEO and Co Founder of DIKY a “nearby people recommendations” app. 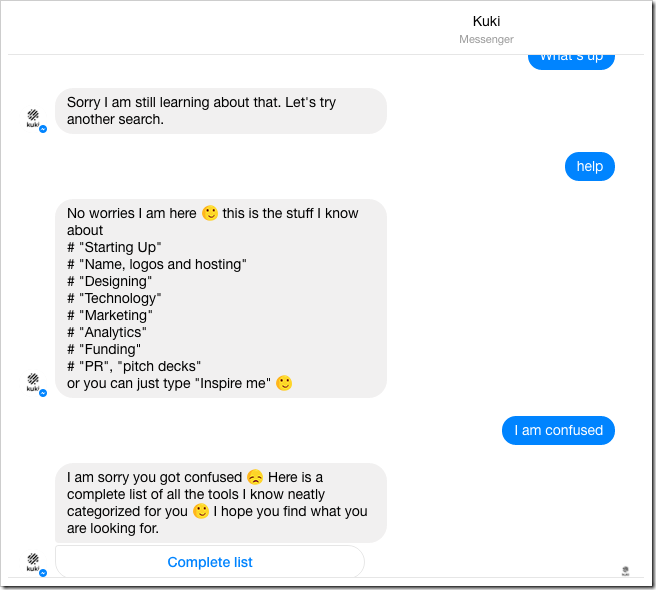 Me and my colleague Rishabh built Kuki bot to share all the learnings we had in our one year of building DIKY. It can recommend 400+ resources to you across 40+ categories to launch, build and scale your business. 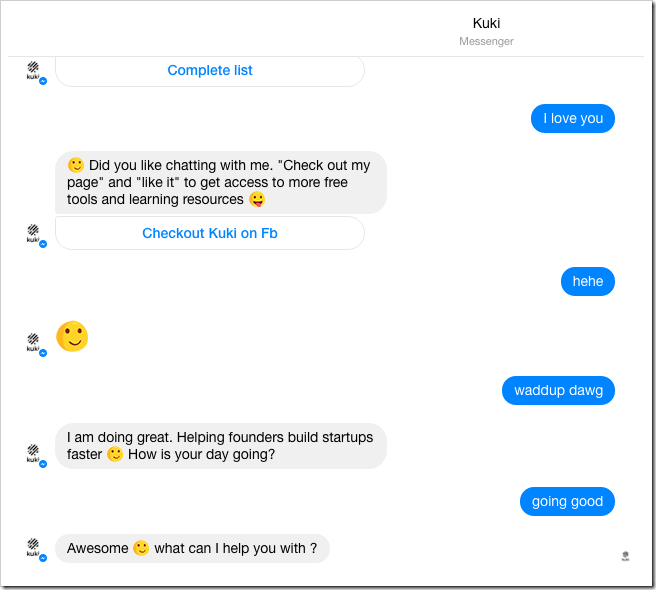 "What is a Messenger Bot and How To Build One Easily! ", 5 out of 5 based on 7 ratings. I have privacy concerns, which is why I use Threema instead of Facebook Messenger and the like. How can I create a bot for Threema? I understand I’ll have to use their Gateway service. Any ideas?